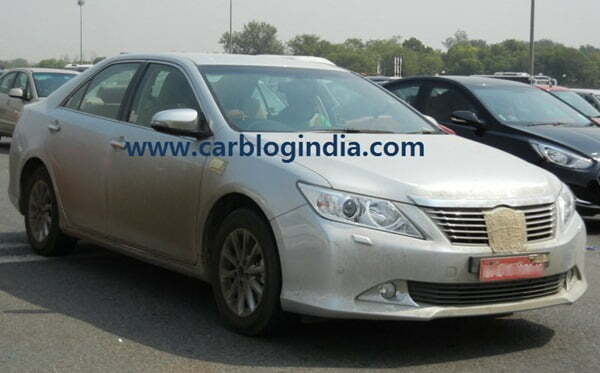 On 3rd July 2012 on my way to Gurgaon from Delhi, I spotted 2012 Toyota Camry Facelift new model for India. Luckily we were at the toll booth and I managed to get to the parallel toll lane and get a good view of the car with some clear spy pictures and one high definition video of the test car in motion. 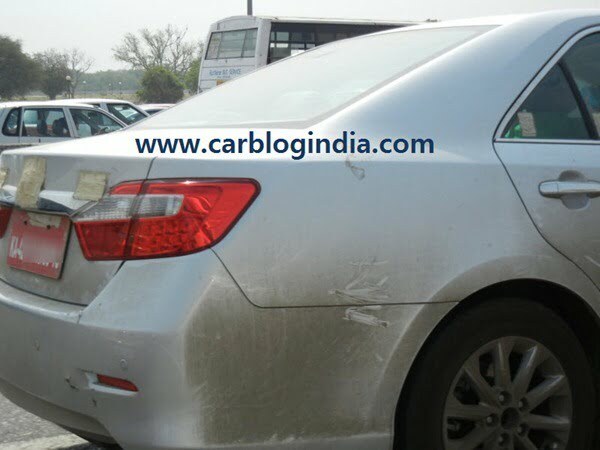 In this article I share these exclusive pictures and video with you and talk in brief about the new features and aesthetics of the new 2012 Toyota Camry for India. 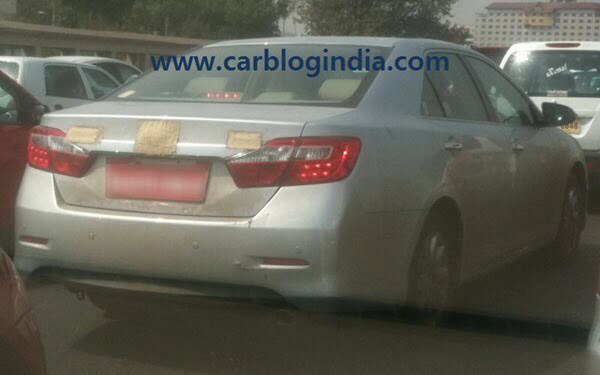 Toyota India has already unveiled the 2012 new Camry at the Auto Expo 2012 which seems to the same car except for some changes which we expect to be made to the final production version which is because of some fine-tuning and small changes made to cars after their thorough road testing. 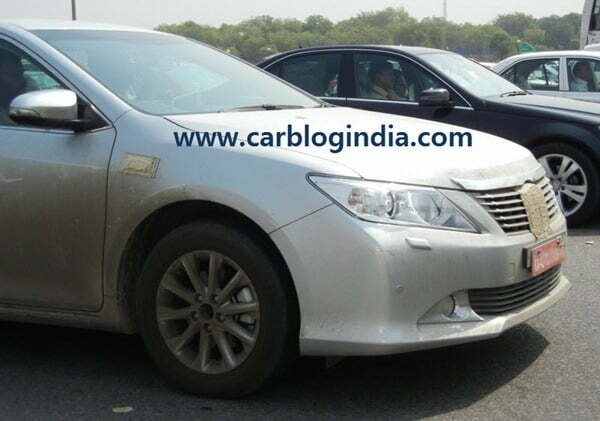 Since the Camry has been spotted testing in various locations in India in recent past, it is expected that the launch is approaching and it maybe launched before October 2012 as the festival season of Diwali starts around November 2012. The car on test had two adults in the front two seats and there was a GPS Navigation device mounted on the front left side of the windshield on the inside, also the registration number started with KA (Karnataka state registered car) which suggests us that this car is doing probably a very long duration testing from southern parts of India to Northern parts to test it under various climates and terrains of India and Indian road conditions across India. Talking of some of the visual elements and features on the exteriors of the new Camry, the first thing I noticed was the road presence. The size of the Camry 2012 makes its road presence felt quite amply along with the subtle sophistications and elegance it has attached to its simple yet elegant design. There are more flat surfaces and soothing rounded corners at all the exterior panels of the car. Front fascia has large headlamps sweeping to the side and reaching towards the large chrome grille at the middle giving it a nice character look. The large chrome grille has many horizontal chrome strips which make it look premium and elegant at the same time. There is an air dam integrated below license plate on the front bumper. The fog lamps are round but surrounded by triangular shaped chrome inserts which give it very sleek and sharp look which goes well with the headlamp design. All in all, the front fascia is elegant and attractive. The roofline is high and the seating positions is low to maximize the cabin space, the angle of front and rear windshield is also quite smoothly merging with the roof to give it both spacious and aerodynamic character. The large glass area makes the cabin feel airy and comfortable. Outside rear view mirrors are body coloured and have integrated turn indicators on them. The side profile is quite simple with very subtle wheel arches and looks kind of plain but it does not kill the overall appeal because of the large size of the car. There are large 10 spoke alloy wheels which are elegant and simple looking which is again designed keeping in mind the target customers who buy Camry. The rear has a simple boot door which has a large horizontal chrome strip which merges with the design of the tail lamp cluster. 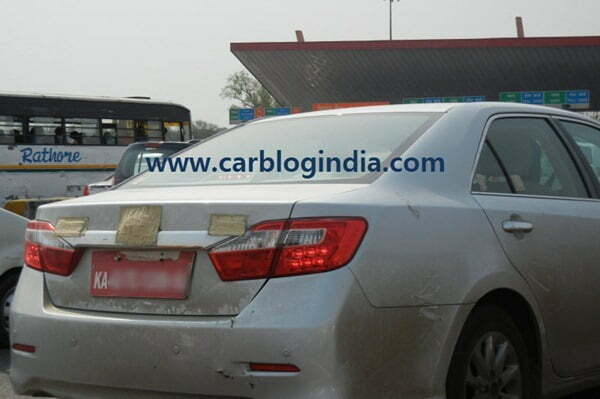 The rear tail lamps sweeps to the side of the Camry giving it a nice clean look at the rear. There are also integrated reflectors on the lower side of the rear bumper on both sides. To the extent we could see in the car running parallel to us, the car has beige interiors and lots of room on the inside. There is beige seats and slightly dark brownish interiors. The test car did not have wood inserts or something shiny that we could notice. Front and rear seats both had adjustable head restraints. Some of the standard features on the 2012 Camry are ABS and EBD, Dual Airbags, Climate Control, Infotainment system to name a few. 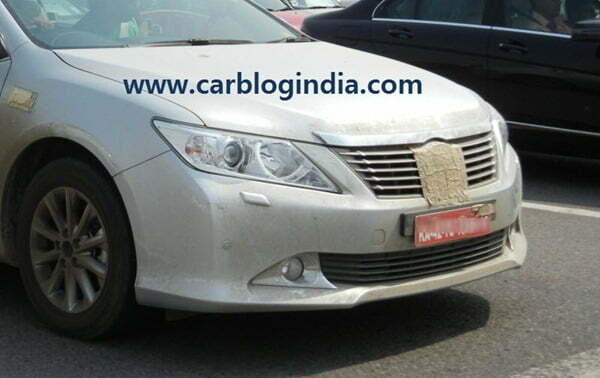 There is still a mystery over the engine lineup of the new 2012 Toyota Camry for India, but we expect that the new Camry will offer both petrol and diesel engine options. 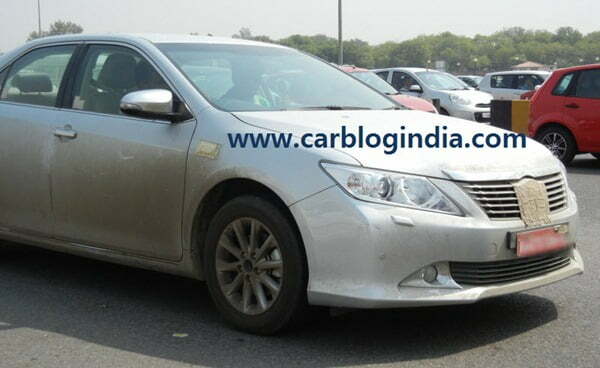 The new Camry will compete with some popular players like Honda Accord, Hyundai Sonata, Skoda Superb and the likes. 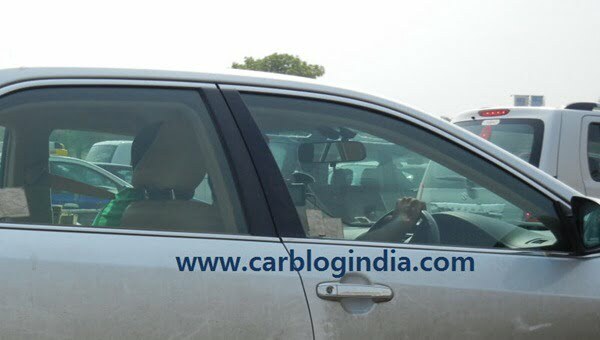 We will bring you all the updates from the official launch when it happens, stay tuned for more updates from Car Blog India.